In one of the learning cycles for Walk My World, we’ve been asked to read and think about two poems — Tupak Shakur’s The Rose That Grew From Concrete (actually, a song lyric, right?) and Identity by Julio Noboa Polanco. So much gets done with Tupak’s metaphor (amid some complaints that it is probably a bit too obvious), so I cast my eyes to Polanco. 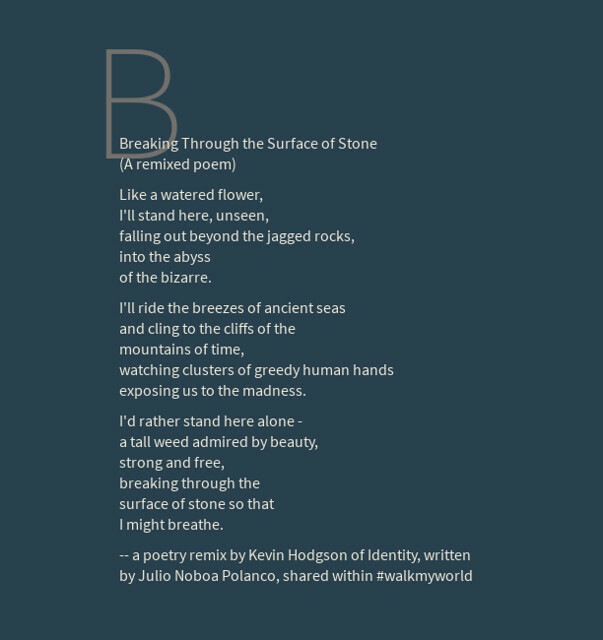 I have not read the Identity poem before, and thought I might try to deconstruct and then reconstruct the words into my own poetry remix. (I hope Polanco won’t mind). This entry was posted in Poetry, Technology Resources, Walk My World. Bookmark the permalink.